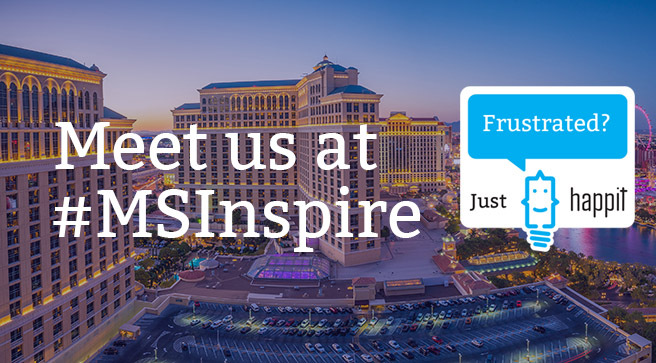 This Year’s Microsoft Inspire is held on July 15-19 in Las Vegas. MS Inspire is an event where partners and Microsoft meet to connect, learn, and collaborate to accelerate the digital transformation and success of our customers. With past attendance exceeding 16,000 people from around the globe, it is an incredible opportunity to strengthen partnerships with Microsoft and other partners while finding new opportunities to build and grow. For Happit, the Microsoft ISV Partner Solution of the year in Finland, it’s a great opportunity to meet our existing and potential partners and get the best insights about the field of user adoption and change management. Meet us in Las Vegas and book a one-on-one meeting! Happit is Microsoft Azure based co-sell-ready service that brings together a contextual learning and faster adoption of digital ways of working. This results more productive and happier employees and growing business opportunities for service providers. Due to this, Happit was also recognized as Microsoft 2018 ISV Partner Solution of the Year in Finland.